Type 4c hair, in all its glory and beauty, can admittedly present a bit of a learning curve to naturals who are still learning about their hair. It may take a while to fully understand what their hair needs in order to thrive, and how it may require a little extra love and care to keep it in its healthiest state. While stretching natural hair is a popular method of styling, it can also be added to a regular 4c hair care regimen to make haircare easier and more efficient. Why Do 4c’s Benefit From This Method? Type 4c naturals have the most tightly-coiled hair, and that combined with up to 70 percent shrinkage and difficulty retaining moisture can create the perfect recipe for damage and breakage. The tight curl pattern of the hair makes it difficult for oils and sebum to travel down from the scalp to moisturize the entire hair strand. To be clear, there is absolutely nothing wrong with living your best life and rocking a beautiful 4c wash and go. Shrinkage is a sign of healthy, thoroughly moisturized hair; but for those 4c’s who have difficulty controlling knots and tangles, wash and go’s are just not practical for an everyday regimen--that’s where stretching comes in. Stretched 4c hair is less likely to curl in on itself, and makes it easier for those natural oils (and added moisturizing products) to travel down the hair strands and retain the moisture, warding off excessive breakage and dryness. Using heatless methods to stretch can also help you avoid frequent use of heat (and irreversible heat damage) and retain as much length as possible. Shavonnie Scott Wilson, professional New Jersey hairstylist and fellow 4c natural, says that although she likes to wear wigs, she prefers to keep her 8-year-old daughter Cecelia’s 4c hair in cute stretched styles. “Specifically in the summertime, I don’t change her styles much, so it’s easier to maintain braided and twisted styles. And her hair is detangled and protected” she says. Her go-to methods of stretching are banding, braiding, and twist-outs. The classic braid-out/twist-out. On thoroughly-moisturized and detangled hair (usually water, a styling cream, and an oil), simply section hair off and twist or braid the hair. Then, take the twists/braids down when they are dry. Check out Halfrican Beaute’s simple tutorial for type 4 hair. 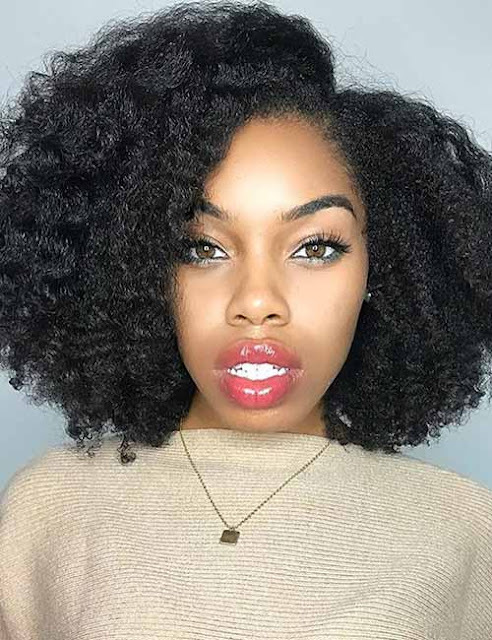 Get the Flaxseed and Black Castor Oil Eco Styling Gel she uses here. African threading is done by sectioning the hair off and wrapping thread around each section. This method is good for keeping the natural curl pattern, while still elongating the hair. Youtuber NaturallyPhilo documented her results, check it out below. Bantu knots are accomplished by sectioning hair off as desired and twisting the hair, while wrapping it into a small knot. Some people twirl the hair around their finger, while others actually twist two pieces of hair together. Youtuber Ambrosia Malbrough does a two strand twist and then a bantu knot; take a look. In addition to aiding in hair maintenance, the ability to stretch type 4 hair presents naturals with several different styling options to switch it up and keep things new and fresh. Type 4c coilies can easily transition between a soft, fluffy afro with maximum shrinkage, to a super defined twist out or blown out style. If your coils seem to be dry and knotted regularly and you don’t wear stretched styles, give one of these methods a try. Do you stretch your hair? If so, what’s your favorite method? Go ahead and comment down below.